Many well-meaning gardeners plug away applying herbicide after herbicide on a relentless crop of weeds, or vegetable gardeners diligently plant, water, and weed only to have a disappointing crop, or flower gardeners wait year after year with beautiful foliage and no blooms. If you can relate to these problems, you may have an issue with your soil. Soil issues are among the most common reason for unsuccessful yards, ornamentals, and vegetable gardens. Soil is a living, breathing medium composed of solids, liquids, and gases. It provides five major functions in our environment including: habitat for organisms, recycling waste products, filtering our water, serving as an engineering material, and providing a medium for plant growth. This last function is the one we focus on for horticultural purposes. Within this role, soil provides stability for plants, retains and relinquishes water, and provides nutrients required for plant growth. Ideally our soils would be around 50% porespace and 50% solids. This porespace should be equal parts water and air, and can be created by practices like tilling, while poor drainage and compaction may reduce porespace. Martin County has primarily sandy soils. This has many impacts on our horticultural pursuits, including a continuing need for lime and fertilizer as our soils tend to become more acidic over time and many of the nutrients tend to leach out of the well-draining soil. In addition, in order to successfully grow vegetable crops and some other ornamentals, soils often have to be amended with organic matter to improve fertility and increase soil moisture. Good aeration, drainage, and the ability to hold moisture and nutrients are the keys of the ideal soil environment. Fortunately, there are many practices that can improve these qualities in our soils. First, soil compaction should be minimized by regularly aerating lawns and high traffic areas, and avoiding foot traffic in garden beds or on wet soils. Strategies should also be put into place to reduce drainage issues and decrease erosion. Cover crops can be used in beds to add nutrients to the soil and reduce erosion. 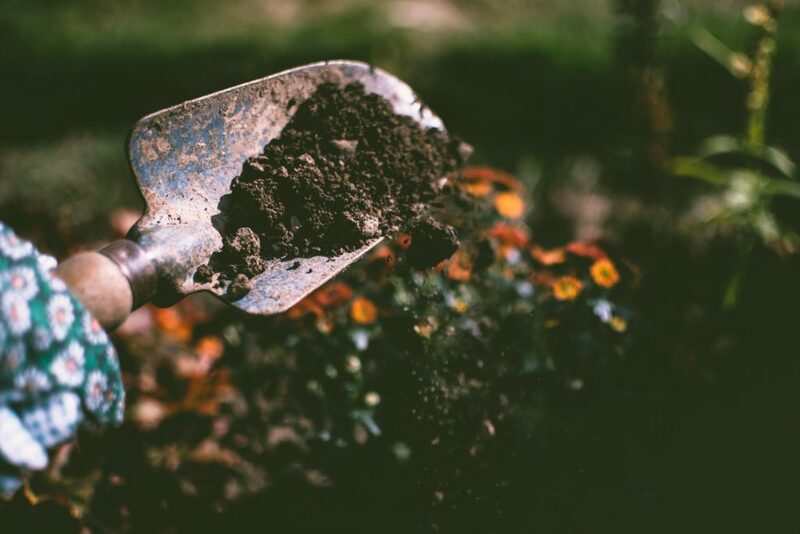 Organic matter, such as compost, can be added into soil, and a 1-3-inch layer of organic mulch on the soil surface of garden beds can help to improve both water retention and fertility. One of the most important steps to understanding and meeting the needs of your soil is to conduct a soil sample. Soil sampling provides valuable information about the pH and plant-available nutrients in your soil. This will allow you to have the most accurate recommendations for lime and fertilizer application to maximize the health of your soil and tailor your soil to your desired plants. Inexpensive test kits that can be purchased in stores and online are unreliable, for this reason it is recommended that homeowners run samples through the N.C. Department of Agriculture & Consumer Services Soils Lab. The N.C. Cooperative Extension, Martin County Center can help provide detailed instructions, forms, and soil sample boxes and tools to assist you with the process of soil sampling. Soil sampling through the NCDA&CS has a $4 fee per sample from December 1 until April 1 during peak season, but is free the remainder of the year. Soil sampling should be done at least every 2-3 years. For more information regarding your soil or any other horticulture question, contact Laura Oliver, Director of N.C. Cooperative Extension in Martin County, at 252.789.4370 or by email at laura_oliver@ncsu.edu. The technical information in this article was sourced from the North Carolina Extension Gardener Handbook (2018). • Cut Your Grass and Your Budget!